With the rise of Amazon, Etsy, and other Internet businesses there has been a marked increase for many in the amount of package deliveries. The convenience of home delivery and the vast array of products online, many at discount prices, has been a boon for customers around the world. Unfortunately, these deliveries have also presented a new easy target for theft in many places. That has been the case in my neighborhood, so I wanted to share some tools I use to reduce the risk of theft. FedEx – Create and account, “My Profile”, via the link at the top right for a multitude of options regarding your packages. Use the “Delivery Manager” to set specific actions for when a package arrives so you don’t miss it. My method is to receive a text message when the package is delivered – it usually arrives within a minute of the package delivery. You can also do other things like set a Vacation Hold to avoid packages sitting on the porch while you’re gone. UPS – Create an account via link at top “New User” for options similar to those available on FedEx, though I find the FedEx site more polished and with more options. Use “Delivery Alerts” to set specific actions for package deliveries. As with FedEx, I use text alerts when a package arrives. If you prefer to know in advance, you can get email or text alerts the day of or day before a package arrives. USPS – USPS does not currently have the same breadth of tools as UPS and FedEx, but you can still create an account with some useful tools. Use the “Register / Sign In” link at the top right to start. I primarily use USPS to hold mail delivery while we’re out of town. Hopefully they’ll add package delivery options in the near future. OnTrac – In San Diego, OnTrac completes a fair amount of deliveries for Amazon though it seems recently that USPS is doing more of that work. Their website options are very limited, and from conversations with company representatives they do not have similar tools to those for other delivery providers. No one knows your habits and schedule like your neighbors. Creepy, right? Exchange your contact information with your neighbors and be a nice person and they’ll probably be happy to pick up a package that’s sitting on your porch if you’d like. If you have the delivery notifications mentioned above set up, you can even call them when there’s a package at your place. Your neighbor probably doesn’t have a formal registration system, but cookies are usually a good starting point. I installed a security camera above our front door to record anyone coming to our home or passing by. It’s also visible from the street so hopefully acts as a deterrent to those considering approaching with ill intent. I opted for the Dropcam Pro due to ease of installation, price point, and low monthly fee structure (which is optional). It cost me $149 plus $10 per month for 7-day online recording, so I can review the tape and save clips if anything happens. The price per month per camera decreases quite a bit if you add additional cameras. 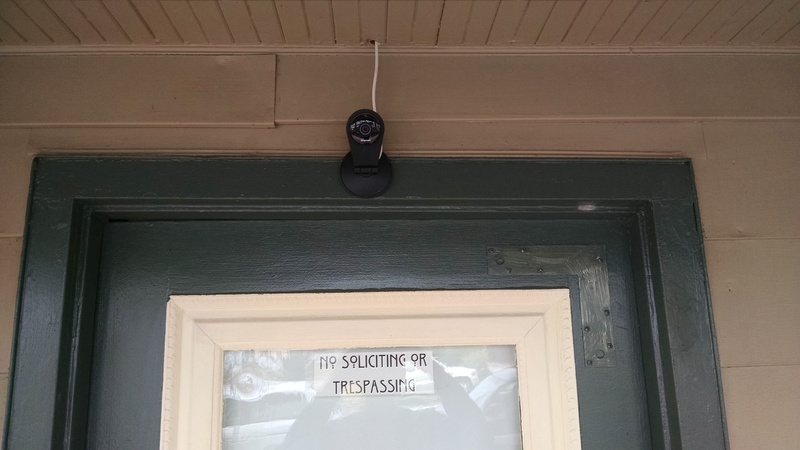 Our front door camera and grumpy old man sign. If you do have a package taken, or other items stolen make sure to report it to the police. 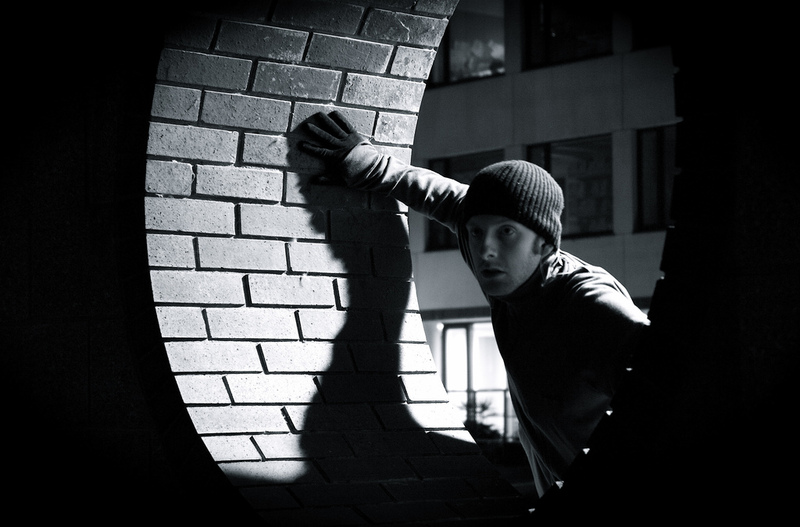 Chances are that you won’t get your item back, but the theft will be entered in the official system and may result in increased patrols or better data for the police to address area issues. If they don’t know, they can’t help. Have you had packages stolen from your property? Have other tips to avoid this problem? Share them, I’d love to hear. Cheers!